During our time in Salt Lake City, checking out all of the latest and greatest in camping gear at the Outdoor Retailer Show, we snuck off for a night of glamping. This entailed awesome tents, tasty beverages, and of course fantastic food. By far the dessert was the best. 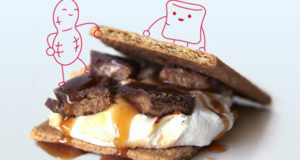 With an array of gourmet s’mores ingredients, we set out to make a perfect s’more. 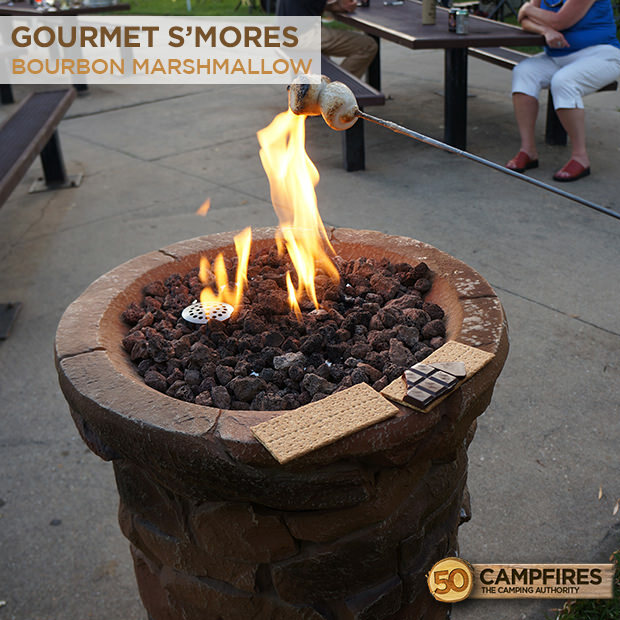 We’re all in agreement that we may have accomplished this with our Bourbon Marshmallow S’more. 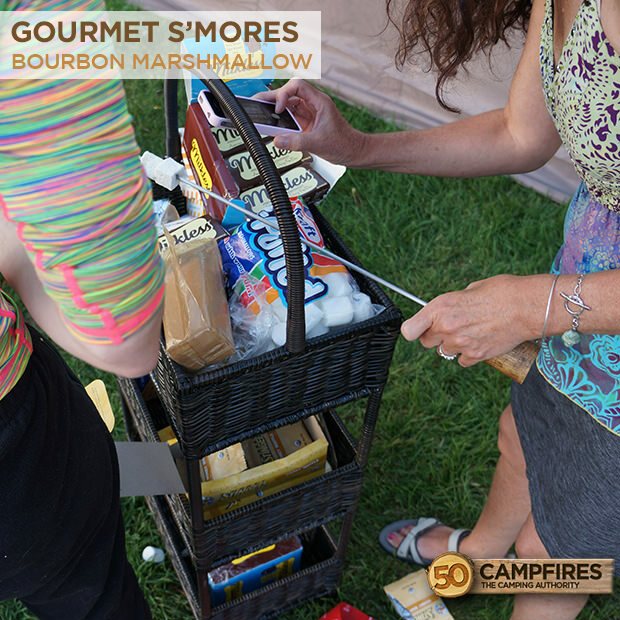 Making gourmet s’mores isn’t hard, and the options are endless. 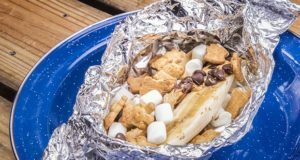 Ingredients are key to the equation, so before you head out on your next camping trip head to a high end candy shop for some of the best chocolates and surf the internet for the flavor of gourmet marshmallows you want. We made our Bourbon Marshmallow S’mores with Honey Stinger’s Honey Waffles. They are thin waffles that come two in a pack and make for an awesome substitute for the standard graham cracker. Next up on our list was Premium Chocolatiers Milkless Chocolate Bar. These things are seriously incredible, are gluten free and created an outrageous tasting s’more. But the most important part of our equation was the marshmallow. Wondermade makes a ton of different gourmet marshmallows from Orangesicle (which is excellent) to Guiness flavored. With an array of options we chose the Bourbon infused marshmallows. After toasting our bourbon marshmallow to perfection we sandwiched it between our honey waffles and premium chocolate to make the most delectable treat we have tasted in a long time. 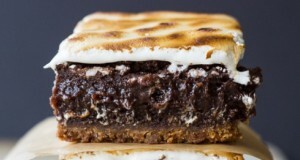 **Note: This s’more gets even better with the addition of bacon. But we all know everything is better with bacon. 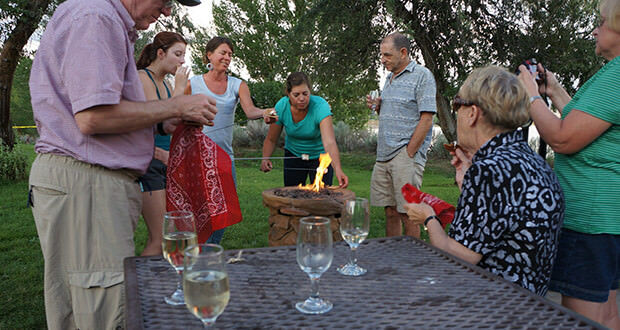 Toast your marshmallow over the campfire until golden brown. Open the package of honey waffles and on one side lay the ½ bar of chocolate. 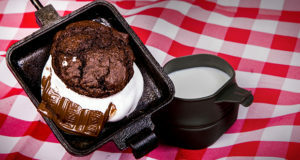 Top the chocolate with your bourbon marshmallow. Sandwich it all together with the second honey waffle.